Click/tap a thumbnail below to view a larger image and description in a separate browser window or tab. Scroll down to read the narrative for this exhibit. For many of us, standing next to the railroad tracks and experiencing the sights, sounds and feelings of a passing locomotive is a unique visceral experience worth repeating many times. Even just walking on the tracks kicking rocks or looking for discarded spikes or hanging out around a train station can be an enjoyable way to spend a few hours. 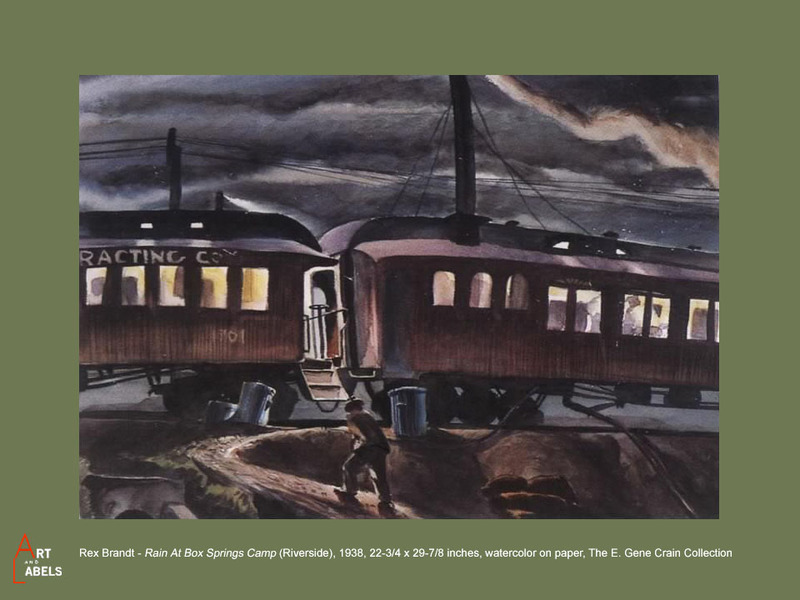 Many of the 1930s era California artists also enjoyed these rail-side activities and in some cases were inspired to visually capture the essence of what they experienced. 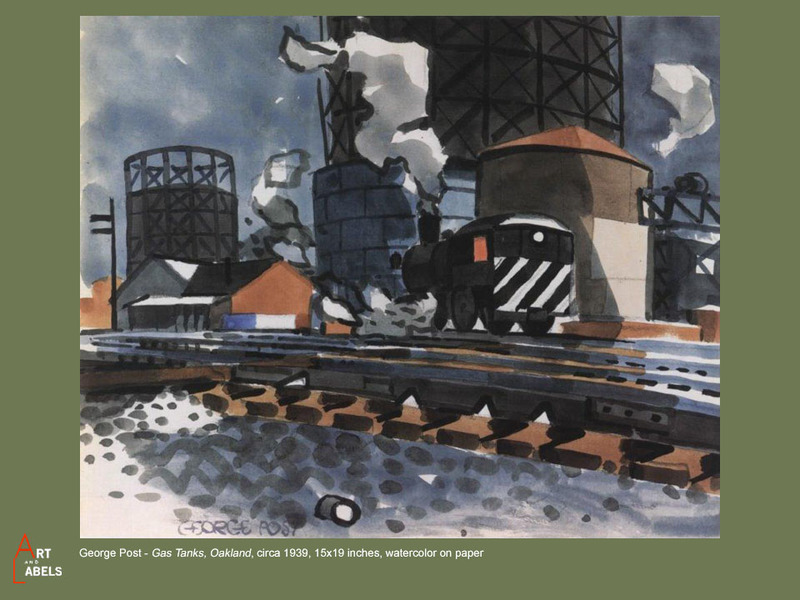 This online art exhibition is an assemblage of train related art by California watercolor artists. All of them were actively producing art during the 1930 to 1970 era. 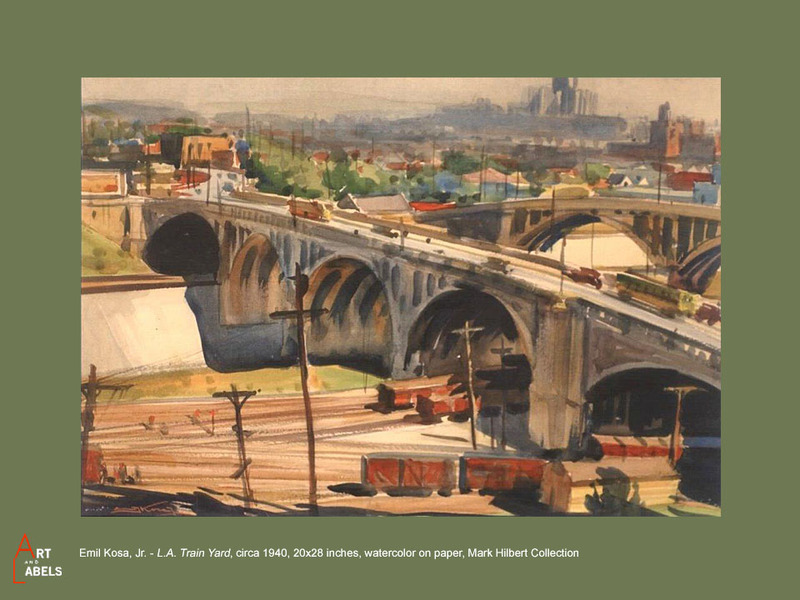 Emil Kosa Jr. spent a lot of time painting in and around the rail yards in Los Angeles. 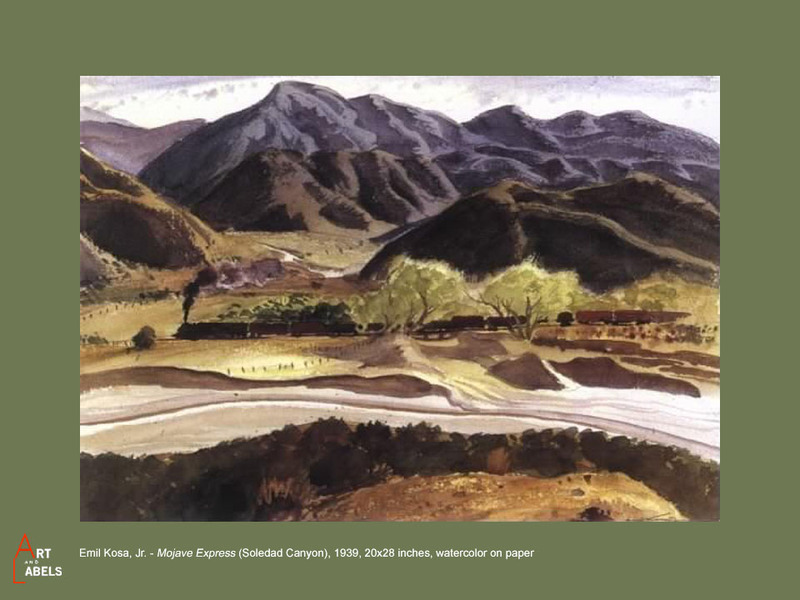 He also traveled to Soledad Canyon on many occasions, where he produced landscape and rural farm scenes which included trains, tracks and railroad activities. 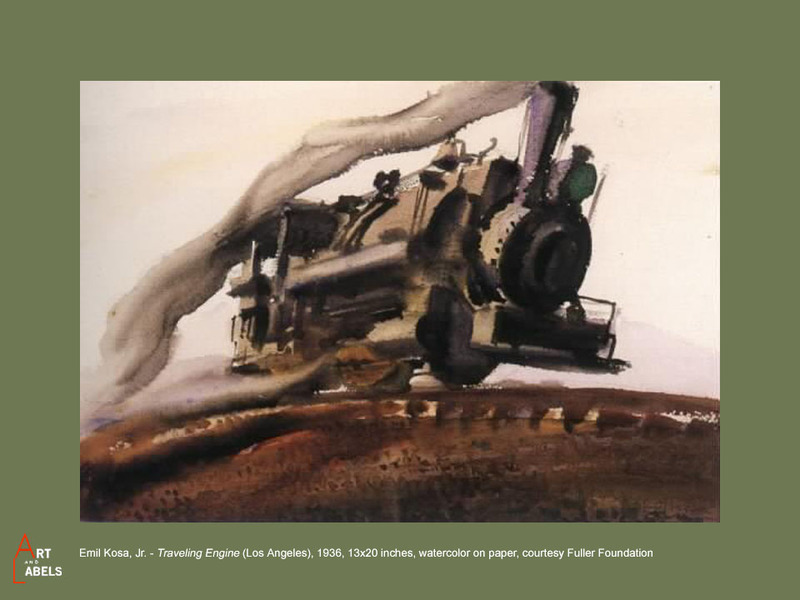 Kosa was well aware that this was the region were the final train tracks were laid completing the first rail line between Northern and Southern California. These were facts which he felt gave his works additional importance. 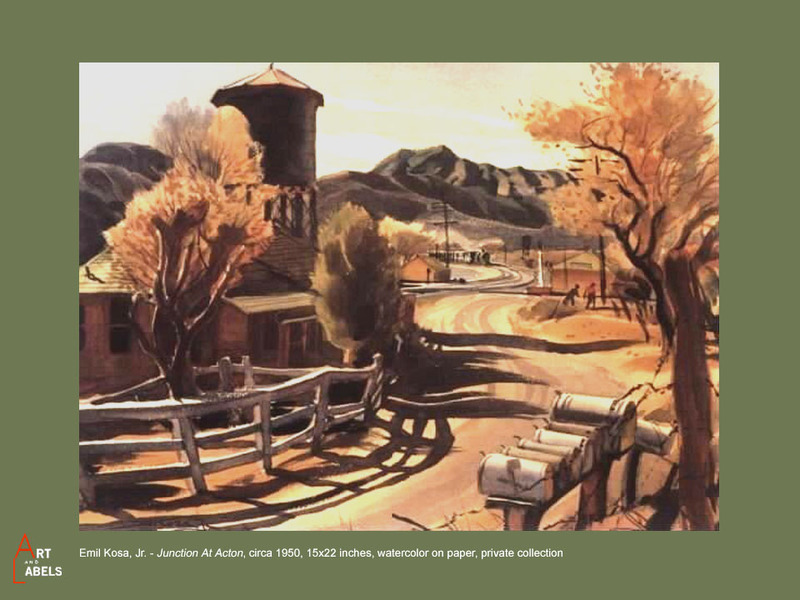 Standish Backus painted on location in Colton and San Bernardino. These were established as rail centers before 1900 and by the 1930s were bustling with rail activities as trains prepared to head to the Midwest and East Coast. 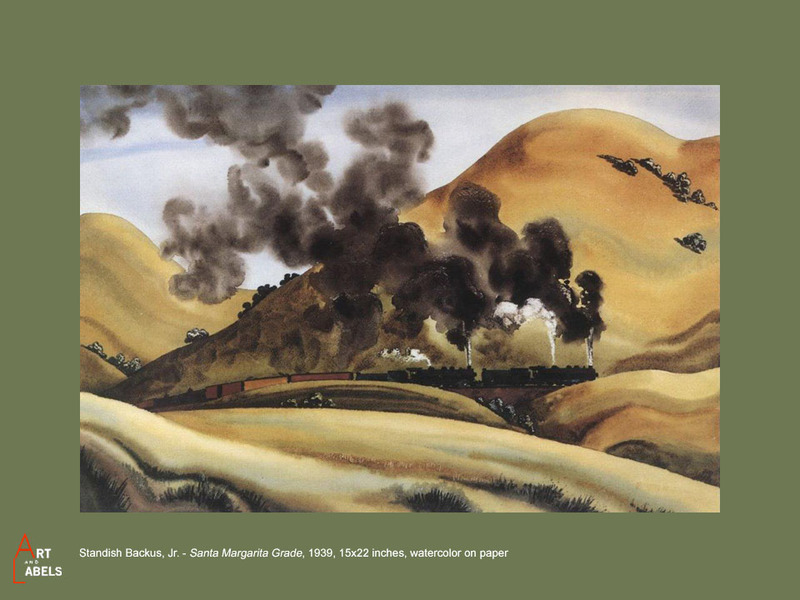 He lived in Santa Barbara and followed the tracks to many locations to find just the right subject matter for his many railroad related watercolors. 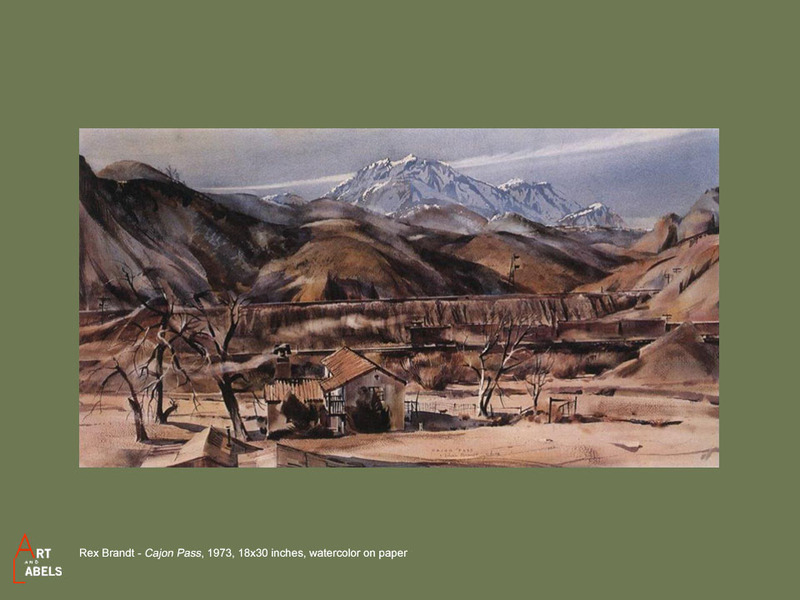 Rex Brandt painted a number of watercolors in the Riverside area. In this region the orange and lemon industry was able to thrive after the railroad came through and made it possible to widely distribute the citrus fruits farmers were growing. 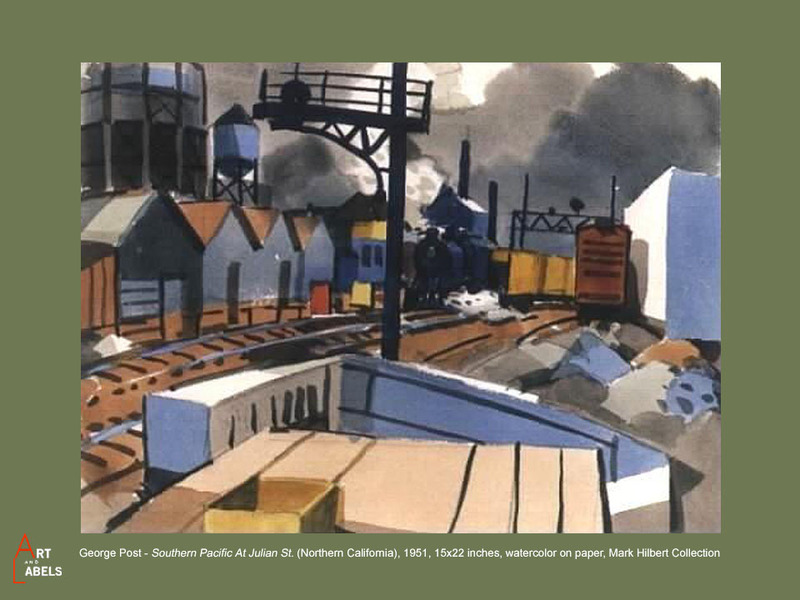 He also produced railroad related art inspired by views he located along the Cajon Pass and in the Tehachapi area. 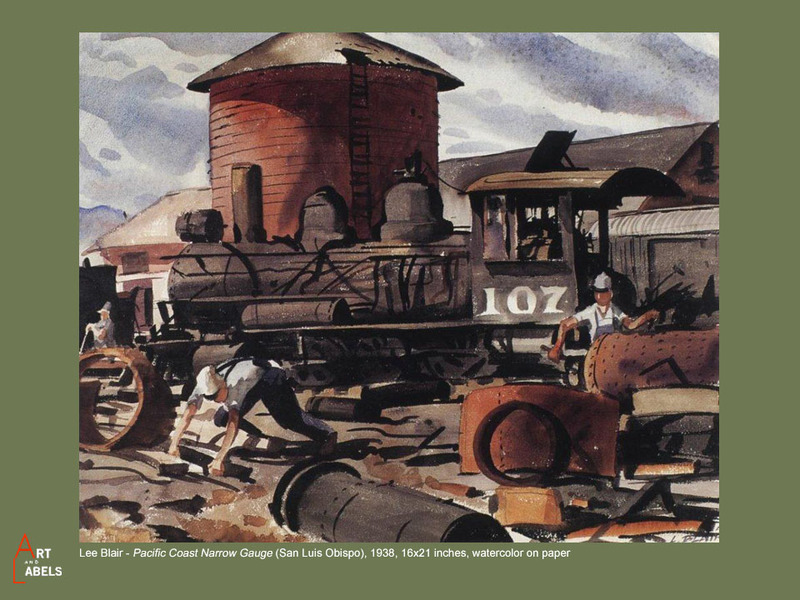 Lee Blair was fascinated with trains. 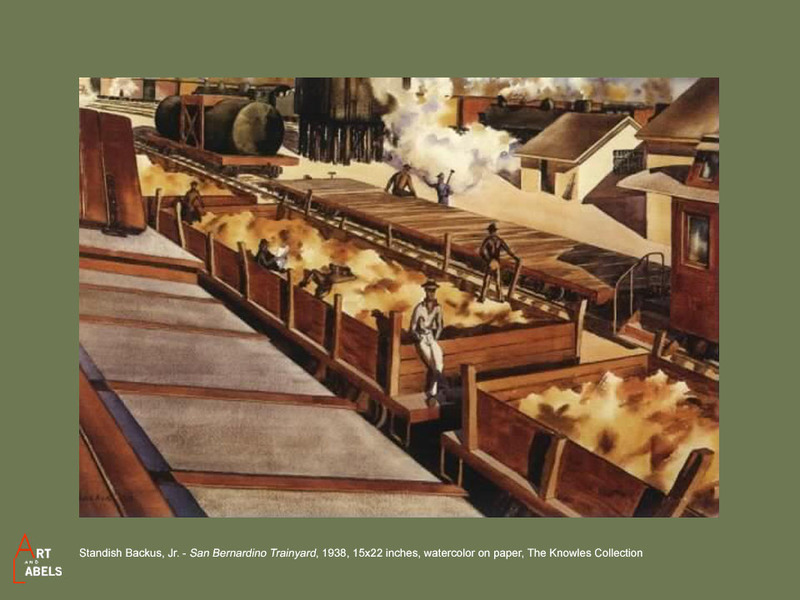 While near San Luis Obispo he visited the headquarters of the Pacific Coast Narrow Gauge Railway and painted works depicting the round house, steam locomotives and even located a railroad scrap yard where he found decommissioned trains surrounded by rusting metal parts used to repair operational engines and cars. It is our hope you enjoy viewing these works. 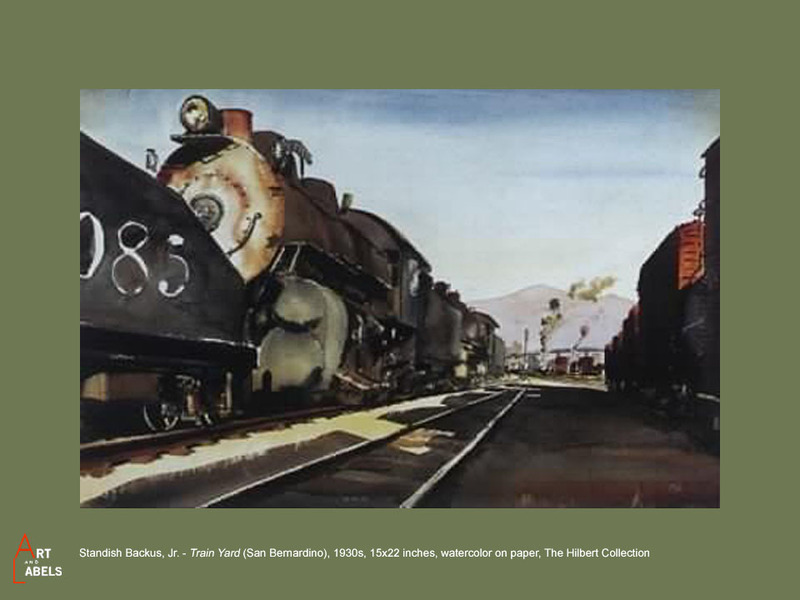 We are planning to do a large, museum exhibition of this type of railroad related art and welcome your suggestions for other relevant pieces to include in this exhibit. © Gordon T. McClelland. All rights reserved. Web design and maintenance by DWW. Contact the Webmaster.